If you have rented M4V movies from iTunes Store, you will be troubled by iTunes' limitation. As you know, iTunes M4V rentals can be played on only one device. Moreover, you must play them on Apple players. So, if you want to play the rental M4V on your PSP, Zune or other players, what should you do? Why can't play iTunes rental M4V freely? Because the DRM protection. Movies rented from iTunes Store are protected by DRM, so, you can't	play them on your non-apple mobile players. M4V Converter Plus could help you. It is the best DRM removal and converter software. This multifunctional M4V rental converter helps you to convert M4V for iPod, iPhone, Apple TV. Or customize main parameters for your needs. It can convert M4V to popular formats, such as MP4, MOV. 2. Import iTunes movie rentals to the converter. 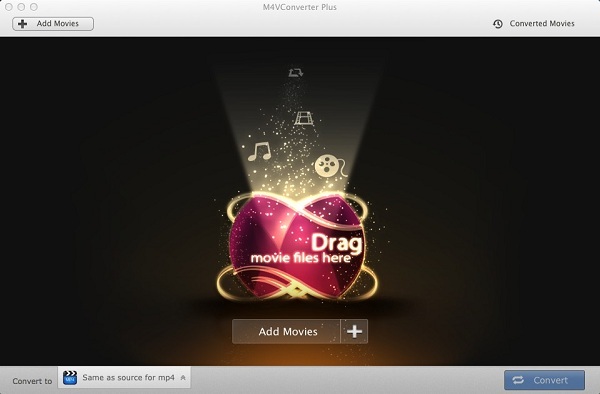 Add M4V files you want to convert by hitting the button "Add Movies" or drag the file to the software directly. 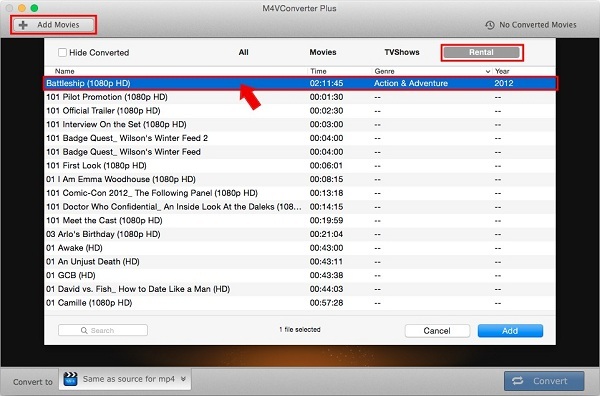 Choose the M4V video files you want to convert from the iTunes Rental by clicking "Rental" section. Then click "Add". Click "Convert to" choose suitable output format. This M4V rental converter tool helps you to convert M4V to iPod, iPhone, Nexus, Samsung devices, etc. 4. Click "Convert" button to start rented iTunes moives conversion. Few seconds later, you can find video converted on your Mac. Copyright © 2008 - 2019 M4V Converter Plus. ALL RIGHTS RESERVED.